Literally, I could not sleep; hyperbolically, I could not breathe, until I finished reading Life Begins at 70 – A Godfather’s Confessional Memoir. . . It’s that good – pure and simple! The memoir of Bola Dauda is breathtaking and “bewitchedly” captivating! This is one book to be read in whole, diligently, and with undivided attention. Reading Bola Dauda rekindles the feelings I had with The Confessions of Saint Augustine. Both are spiritually anchored and authentic. A nugget for readers interested in personal biographies. Dr. Dauda provides practical suggestions that are applicable to those nefarious issues of daily existence and along with it, several amusing stories and anecdotes. Professor Augustine Agwuele, Professor of Linguistics, Texas State University, U.S.A. This book celebrates the narrative character of the moral life, accents the historical nature of social existence, and holds up virtues as the foundation of the good life. In telling the story of his life, Dr. Dauda has put forward a theory of the narrative formation of individual or group character that should enliven social ethics in Africa. Professor Nimi Wariboko, Walter G. Muelder Professor of Social Ethics, Boston University, USA. The critical thinking of Dr. Bola Dauda makes this uncommon autobiography of a naked emperor an inspirational guide to a life of freedom, purpose, integrity, joy and success in the world today. Teens and adults as well as parents will find the cakes one could eat and keep from his bakery in the secret garden delectable and nourishing to the soul. Dr Samson O. Ijaola, Sub-Dean, School of Post Graduate Studies, Samuel Adegboyega University, Edo State, Nigeria. Bola Dauda holds a master’s and doctorate degrees in Political Theory and Institutions from the University of Liverpool. As a scholar, he is widely published in Europe, the United States, Africa and Asia. Dr. Dauda’s writings have been translated into Spanish, Chinese, and French. He is an ex-honorary fellow of the University of Leicester, and a life member of the U.K. Coaching Academy. In 1974, when the first edition of this book was published, Dr. Ogbu Kalu (1942-2009) was a young, devout Presbyterian minister and scholar who believed that the unity of the Church of Nigeria was not only possible but necessary. Indeed, an ecumenical movement had seen a similar need for unity and predicted that this unity would occur in December of 1965. The vision was to create not multiple churches of many denominations, but rather one complete, unified church composed of Anglicans, Methodists, and Presbyterians. However, this was not to be, due to inner negotiations breaking down. Dr. Kalu thus took it upon himself to write a study about the impulses and arguments toward unity and why unity is the true intention of God. This second edition’s publication honors Dr. Kalu’s call to unity, and it allows the modern reader to ponder what unity means in the twenty-first century and the current Church of Nigeria. Peace has remained elusive in Africa. The continent continues to be riddled with insecurity and conflicts that are tearing it apart and stalling its development prospects. Beyond the legacies of colonialism, case studies in this volume highlight different causes and dimensions of insecurity, conflict, conflict management mechanisms and peacebuilding efforts in Africa. Clashes over identity differences and weak governance structures remain sources of the concern. To solve the conflicts, communities have often resorted to the traditional African ways and the modern system based on western rules. Various ways of effecting peace-making and peace building and the weaknesses of the current peacekeeping methods are explored. Busani Mpofu is a senior researcher at AMRI, College of Graduate Studies, University of South Africa, and a Research Associate in the Human Economy program, University of Pretoria. His main research interests are in African economic history, with a focus on Third world urbanization, urban poverty, inclusive development, development discourse and theory, and Land reform and agrarian histories in Africa. Migrant Stories: A Memoir of Living And Survival In The West And Asia is volume 2 of A.B. Assensoh’s life, times and odysseys. With a foreword by Professor Damien Ejigiri, the long-serving Dean of the Nelson Mandela College of Government and Social Sciences at Southern University and A & M College in Baton Rouge, Louisiana, the book provides a unique overview of a professional colleague that he has known for some decades. Dr. Assensoh has provided a proverbial mirror – similar to what Duke University’s distinguished History Professor John Hope Franklin did with his own published memoir – through which his readers can read about a variety of topical migrant stories, which have been couched in his own preface; musings about far away from home stories; faces, places and celebrations; the shocking story of a modern “cougar” pouncing on a young black man; racial escapades in Europe and the Americas; discussions beyond politics, several of which have law flavor, stemming mostly from his latter-day Law Studies; and an epilogue dealing with a discussion of issues before he enters eternity, during which he expects his Alpha Phi Alpha Fraternity members to initiate him into their prestigious Omega chapter, just as it was done for other past deceased members, including the late Rev. Dr. Martin Luther King, Jr., a proud Alpha and Morehouse College man. Similar to what he shared with his readers in volume one of his earlier published memoir, Dr. Assensoh has provided readers of Migrant Stories: A Memoir of Living and Survival In The West And Asia with several memorable photos, with appropriate captions. A.B. Assensoh, LL.M. (Oregon), PhD (NYU), is professor emeritus of Indiana University, and courtesy professor emeritus of University of Oregon. Assensoh, a trained journalist and historian, is author, editor, or co-author of several scholarly articles and books, including A Matter of Sharing: A Memoir (PAUP, 2016); African Military History and Politics: Coups and Ideological Incursions, 1900-Present (Palgrave, 2002; 2006); Malcolm X: A Biography (Greenwood, 2014); Malcolm X And Africa (Cambria, 2016); African Political Leadership: Jomo Kenyatta, Kwame Nkrumah and Julius K. Nyerere (Krieger, 1998). Ghana-born A.B. Assensoh lives in Eugene, Oregon, USA with his lawyer-political scientist spouse (Dr. Yvette M. Alex-Assensoh) and their two sons, Kwadwo and Livingston, both students of the University of Oregon. Looking back from the Future provides an imagined perspective looking back from an unspecified time in the future, on significant events in the eras that have passed. Onitsha today is a leading Igbo and Nigerian city on the banks of the River Niger. In the envisaged future it is a major city in what has become a ‘World of Homelands.’ The defining feature dividing early and later eras is: ‘rooted ethic.’ In the early eras the ‘Ethic of Darkness’ (with attendant attributes of exclusion/division/acquisition) is dominant. In the later eras the ‘Ethic of Light’ (with attendant attributes of realization/actuation/civil persuasion/inclusion) is dominant. Looking Back explores prospects offered by the ‘transformational’ properties of the computer, the internet and the world of cybernetics. It suggests possibilities for movement out of Darkness, into sustained Light, and on towards establishment of the Civil Commons, throughout what is envisaged as a World of Homelands’—the socio-ethno/political units that have replaced States and most Nations. Professor Michael Vickers, historian and writer with a range of scholarly, literary and journalistic contributions over the past fifty years, has given much of his mind and heart to the land and folk of Nigeria; and in more recent years to projecting their path, along with all Africa folk, to what he perceives as the Horizon Future. Recipient of the Distinguished Academic Award (2012) from the University of Ibadan, he has taught and conducted research at the University of Ife (now Obafemi Awolowo University) Nigeria, and other universities in America, Canada and UK. He is author of several acclaimed books, including most recently, On Wings of Light (2015), and Bright Beams in Dark Shadow (2017); the principal themes of which derived from this current work, Looking Back from the Future, in its original (2011) form. He holds a doctorate in Political Science and West African Studies from the University of Birmingham, UK, and is Emeritus Director of Parliamentary and Public Affairs, The Hillfield Agency (UK). The International Solidarity Movement emerged out of post-World War II anti-colonial struggles, and drew on the organisational capacity initially of South African anti-apartheid organisations, liberation movements and exiles. It matured in the post-colonial period and in the context of the Cold War. As a global social movement, it engaged in national and global collective action aimed at social action and transformation. Its modes of protest, research and knowledge dissemination, forms of mobilisation and the knitting of global networks make it unique. It is not simply the sum of its constituent parts, or even its membership, or reach. It was the locus of global solidarity and action. It reached globally and in so doing drew individual and collective acts of anti-apartheid into a broader common political space that transcended national boundaries. Forms of anti-apartheid action in multiple political spaces in many spheres and arenas became one of the defining characteristics of the International Solidarity Movement as a global social movement. There, but for the grace of God is a gripping and detailed memoir of the handling by the Nigeria military government of the 1984/85 strike action by mostly the Nigerian Resident Doctors under the auspices of the Nigeria Medical Association. Professor Abiodun O K Johnson, the author, was then Professor of Pediatrics, the elected Provost of the College of Medicine, University of Ibadan, and the ex-officio Chief Medical Director (CMD) of the University College Hospital (UCH), Ibadan. As a consequence of the doctors’ action, the striking doctors were dismissed from their jobs. Professor Johnson was removed and he was retired from the Public Service with immediate effect, a decision he has always contended was wrong. About 4 years later and following a change of government, the dismissed Resident doctors were allowed to return back. The author was also re-instated as Professor at the University of Ibadan. He, however, chose to go on voluntary retirement and has been domiciled in the United States of America since 1985. He believes that the regrettable state of Nigeria is a result of recurrent mismanagement by the country’s governments. He also believes that, given the military culture and mentality, it has no business running a country. Professor Abiodun Johnson, MD FRCP DCH FWACP FAAP FACN, was born in Lagos in 1939. He obtained his medical degrees (MB, BS U. London) in 1965 at the University College Ibadan (UCI); his Postgraduate / Residency training in Pediatrics and Internal Medicine in the UK: and his post-doctoral Fellowship training in Pediatric Gastroenterology / Nutrition at Stanford University Medical Center. He was the first to be awarded the MD degree by the University of Ibadan. Since leaving Nigeria in 1985, he has held academic / teaching appointments at various medical schools in the USA until he retired as a Professor at the Texas Tech University Health Sciences. He has three daughters, two of whom are also physicians and the third is a Mechanical Engineer. Professor Johnson now spends his time reading, writing, swimming, traveling, and singing in a Church choir. This book captures the full essence of Victor Ekpuk’s work as an artist of global reputation, a master of mysterious scripts, ancient signs and symbols. His messages, encrypted in nsibidi and other symbols and signs, find expressions in paintings, illustrations, cartoons and murals. His powerful messages are encrypted in those signs and symbols in ways that are sometimes obvious, often times complex, and subject to multiple ambiguous meanings, from the ritualized to the sacred, from the secularized to the mythical. In this book, twelve talented authors reflect on the artist, his background, the foundation of his creativity, and the interpretations of his symbolic messages. This book examines the progress that Black Americans have made in the United States in the post-World War Il era, from the framework of American citizenship. The data in this book show that Black Americans have made substantial social, economic and political progress during this period. For example, as of 2013, there were 60,000 Black American physicians; 50,000 lawyers and judges; 111,000 engineers; 329,000 mathematical or computer scientists; and 305,000 registered Nurses. However, depending on the variable examined, one would find a gender gap favoring either males or females. For example, by 2016, there were 2.446 million Black women and 1.841 million Black men aged 18 and over with at least a bachelor’s degree. While there are more Black females in the U. S. workforce, including in the top job category, professional and managerial positions (33.4% vs. 23%), Black males continue to earn higher incomes. This book presents various explanations for these gender gaps within the Black American population and the implications that result from them. Amadu Jacky Kaba is an Associate Professor of Sociology at Seton Hall University. Prior to returning to Seton Hall University in 2005, he worked with the late renowned political scientist, Professor Ali A. Mazrui (Post-Doctoral Fellowship), teaching and conducting research in the Social Sciences at Binghamton University, State University of New York, and Cornell University in Ithaca, New York, from July 2002 to June 30, 2005. He is the author of almost 80 scholarly publications including over 50 full-length peer reviewed scholarly journal articles and six books. He earned all of his degrees from Seton Hall University: B.A. in Political Science in 1997; Master’s degree in Public Administration (MPA) in 1998; and Ph.D. in Higher Education Leadership, Management and Policy in May 2002. Is the State still relevant for development in contemporary Africa? There have been several scholarly efforts geared toward understanding the role of the State in facilitating socio-economic development in Africa. While some see the State as a benevolent political authority which possesses the necessary mandate and responsibility to advance development, others see it as an area for personal accumulation and rent sharing. Indeed, there have been mixed results on the activities of the State and economic development in Africa over the past five decades of gaining political independence. This book contributes to the debates on the domestic and external forces that have continued to shape the role of the State in fostering socio-economic and political development in post-independent Africa. Contributors to this volume went beyond diagnosis of the challenges facing the continent to proffering solution and charting alternative strategies for achieving inclusive development. This book provides insightful analyses from multi-disciplinary perspectives on the nature of the state and development in Africa. It covers an array of topics such as Pan Africanism, Governance, Inter Governmental Institutions, Regional Integration, the African Diaspora, Leadership and Peacebuilding, seeking to not only highlight the problems facing the continent but also to challenge the dominant western lenses through which they have been interpreted. It showcases the thinking of African scholars and charts a new development agenda for Africa. It makes a useful contribution to the debates on state and development in Africa. Cheryl Hendricks, Professor of Political Science, University of Johannesburg, Johannesburg, South Africa. Samuel Ojo Oloruntoba, PhD is a Senior Lecturer at the Thabo Mbeki African Leadership Institute, University of South Africa. He is co-editor with Toyin Falola of the Palgrave Handbook of African Politics, Governance and Development, Palgrave Macmillan, New York, 2018. Professor Vusi Gumede, a former Associate Professor at the University of Johannesburg, is the Head of Thabo Mbeki African Leadership Institute at the University of South Africa researching and publishing in the political economy of development in Africa. This volume is an attempt to consistently think through the reform of the public administration and public service dynamics that could serve as an institutional framework for reorienting Africa’s postcolonial predicament. Africa has often been regarded, among other uncomplimentary epithets, as the most difficult administrative contexts in the world. The failure of the public service in Africa is essentially the failure of the democratic experiment in Africa. The ten lectures gathered in this significant volume derive from the author’s practical and intellectual involvement with public administration thinking on the continent including the articulation of the African Public Service Charter under the auspices of the African Union Commission. The essays are all united by a firm conviction that once the public/civil service in Africa fails, then all else has failed in terms of an infrastructural transformation of Africa that will make democratic governance a meaningful experiment for Africans. The volume therefore delivers a serious trajectory of how the African public service and administrative dynamics can leverage on global best practices and existing reform ideas to undermine the African predicament and install good governance for Africans. Tunji Olaopa, PhD, a retired Federal permanent secretary in Nigeria, is a Fellow of the Institute of Management Consultants of Nigeria and recipient of the 2015 Nigerian National Productivity Order of Merit Award. He is now the Executive Vice Chairman of the Ibadan School of Government and Public Policy (ISGPP), Nigeria. He combines an uncommon theoretical and practical insights into the reform dynamics of the Nigerian and African public service that derives from an over twenty seven years of reform crusade concerning the operational workability of democratic governance and the imperative role and responsibility of the civil service. Tunji Olaopa is the author of over a dozen other books including Public Administration & Civil Service Reforms in Nigeria (2012); Innovation and Best Practices in Public Sector Reforms: Ideas, Strategies & Conditions (2012); Public Service Reforms in Africa (2010); Managing Complex Reforms: A Public Sector Perspective (2011); The Joy of Learning (2009); and The Labour of Our Heroes (2016). This volume combines conceptual and empirical methodology to connect the administrative dots between the dynamics of democratic governance and the imperatives of development in Nigeria. The optimism underlying this book derives from the author’s reflection on the connection between democratic governance, the civil service in Nigeria and the critical import of reform as the sine qua non for achieving not only a paradigm shift in Nigeria’s productivity profile, but also as the means through which democracy can become a truly liberating ideology for Nigerians. The volume explores a deep historical strategy as an administrative method by which to understand why the capability readiness of the Nigeria civil service system has been compromised and how a deep political commitment to the transformation of the ministries, departments and agencies (MDAs) can transform Nigeria in terms of infrastructural and human capital development. This book provides important aspects of African diasporic experiences, covering the mass movement of Africans to Asia, Europe, and United States of America, the resistance to the epistemic violence caused by slavery and slave revolts, and the survival of African culture in the Diaspora. The book also explores the role of arts in fostering development as well as the influence of slavery and religion on Africans. Given the contradictions that continue to define African experiences in the global capitalist system, the book offers some alternative points of departure. Samuel Ojo Oloruntoba is a Senior Lecturer and the Coordinator of the Research cluster on Innovation and Developmental Regionalism at the Thabo Mbeki African Leadership Institute, University of South Africa, Pretoria, South Africa. He obtained his PhD in Political Science with specialization in International Political Economy of Trade from the University of Lagos, Nigeria, where he is a tenured Faculty member. Oloruntoba is the author of Regionalism and Integration in Africa: EU-ACP Economic Partnership Agreements and Euro-Nigeria Relations, and co-editor of Regenerating Africa: Bringing African Solutions to African Problems and the forthcoming Palgrave Handbook on African Politics, Governance and Development. Oloruntoba received the 2016 Wangari Maathai Award for Innovative Research Leadership at the University of Texas in Austin. Gender, Culture and Development in Africa interrogates ways in which gender, culture, and development in the African context reinforce, shape, and reshape one another. In four parts, comprising fifty chapters, the book provides stimulating debates and constructive engagements about the enactment of gender and power relations within the African context and its implications for development outcomes. The engaging and carefully organised chapters furnish the readers with a sumptuous “buffet” of narratives, pedagogical dialogues and critical discourses on African women and men in their varied cultural, political, economic and social contexts. The multidisciplinary approach traversing literary studies, education, political science, religious studies, linguistics, history, economics, and law, amongst others, makes the book relevant to scholars of gender and African studies across these disciplines. Mobolanle Ebunoluwa Sotunsa is a Professor of Gender Studies and African Oral Literatures in the Department of Languages and Literary Studies, Babcock University, Nigeria. Olajumoke Yacob-Haliso is an Associate Professor of Political Science at Babcock University, Nigeria. This is a must read book for anyone interested in the issue of gender imbalances between men and women in pre-colonial, colonial, post-colonial, and contemporary Africa. The subject of gender in societal development continues to attract scholarly attention globally in recent times. This volume brings together fifty essays written by established and upcoming scholars, male and female, all placing their essays in the context of momentous events and profound social changes that have marked gender, culture, and development in our time. This high quality collection offers strong individual essays that, when read together; add up to more than the sum of their parts. The volume is bound to change how we think about and perhaps how we study gender in Africa. Akintunde Akinyemi, Professor and Chair, Department of Languages, Literatures, and Culture, University of Florida. An eloquent testimony of the beauty of multidisciplinary discourse in unearthing the dynamic concept of gender especially in a multicultural setting as Africa. A reference material. Ayandiji Daniel Aina, PhD, Professor of Political Behaviour and Communication & President/Vice Chancellor, Caleb University, Lagos, Nigeria. What options do African countries have to grow their economies and improve the living standards of their populations? What course should their socio-economic development take? The book reasons that African states, more than ever, need partnerships with the outside world in the development of the continent, based on equality, mutual benefit and win-win cooperation. This need has arisen as many Africa nations experience decreases in their fortunes in economic development and equitable distribution of resources among their peoples on the one hand, and increased dependence on development aid and loans from developed nations and international monetary regimes, on the other. The book opines that genuine partnerships with donor countries should distinguish between a simple analogy of other nations’ development experiences and the genuine analysis of the respective dynamics of cases of African nations. It concludes that beneficiation of African raw materials on the continent is a key to Africa’s success in boosting economic growth, development and reduction of poverty and unemployment. Alexius Amtaika is a Research Professor at University of Limpopo in South Africa. He holds a PhD in Political Science from the University of the Witwatersrand in Johannesburg, South Africa, specializing in Political Theory and Governance of Local States. He is the author and editor of four books. He is a former recipient of the University of Michigan African Presidential Research Fellowship (2008-2009). He is also the founding Editor-in-Chief of the Journal of African and Asian Local Government Studies. The long and arduous struggle for human and civil rights is a defining theme in the historical experiences of African people and their descendants in the Diaspora. Challenges to fundamental human and civil rights continue to manifest in multiple dimensions, and are still critical issues in the political, economic, and social realities of black people. Featuring thirteen original chapters contributed by scholars from both sides of the Atlantic, this book interrogates the complex dynamics of human dignity and rights within the global African context from a multidisciplinary perspective. By providing an integrated discourse on fundamental issues of human and civil rights such as state repression in the modern African state, women’s rights, minority rights, the right to education, and racial disparities and injustice in Black America, the book offers academics and the general reader a valuable resource to understand the historical and contemporary processes shaping human rights and freedom in the African world. The book advances an important argument: that oppressive ideologies and practices which disproportionately victimize black people in Africa and in various diasporic locations have compelled the victims to develop a rich conceptual repertoire on rights as well as a robust vocabulary and a set of ameliorative methodologies for demanding and defending their human and civil rights. The most indelible contribution of this volume is that it insightfully and coherently weaves the struggles and sociopolitical experiences of African peoples in multiple spatial and temporal settings into current debates on human and civil rights. In this regard, the editors and authors clear a space for the universal idioms of rights to productively engage with the experience of and struggle for these rights in historically marginalized communities. A rare collection of definitive, compelling and discursive accounts of multifarious manifestations of the age long struggles of the Black race for human freedom and civil rights on both sides of the Atlantic, Adebayo Oyebade and Gashawbeza Bekele’s The Long Struggle: Discourses on Human and Civil Rights in Africa and the African Diaspora is authoritative, well conceived, and a major addition to the thin body of literature on the subject matter in Global African historiography. Adebayo Oyebade is Professor and Department Chair of History at Tennessee State University. Gashawbeza Bekele is Assistant Professor of Geography at Tennessee State University. This collection of the essays and books of the late Professor J. A. Atanda covers the broad spectrum of his work on the Yoruba, the Old and New Oyo Empire, colonial Nigeria and Buganda, and reflective essays on a newly independent Nigeria. Divided into five parts according to each of these themes, The Collected Works of J. A. Atanda is unique for encompassing the scope, breadth and depth Of the scholarship of Professor Atanda over the course of some thirty years. The collection definitively represents the contributions of Professor Atanda to African scholarship in general and fortifies our memory of the meaning of that scholarship. Thank God, someone has finally noticed the pivotal contribution of a mega-intellectual. This book by Professor Toyin Falola is the megaphone that sounds the trumpet of the essential works of the late Professor J. A. Atanda, perhaps the greatest chroniclers of Yoruba history. No doubt, The Collected Works Of J A. Atanda is another notable work that celebrates one of our unsung intellectual generals, an essential read for any lover of Yoruba history. This is a beautiful and excellent collection in remembrance of a renowned and worthy Yoruba historian. Professor Atanda’s intellectual legacy is not just his painstaking reconstruction and penetrating analyses of the Yoruba past, but also his unique presentation style. The dexterity with which he simultaneously juggles political and social themes marks him out as the quintessential historian. Toyin Falola is a historian of the Yoruba and Nigeria, founder and co-editor of Yoruba Studies Review. He has produced over 160 books, and honored globally –including seven honorary doctorates– for his scholarship and service. He is a University Distinguished Teaching Professor and Frances and Sanger Mossiker Chair in the Humanities at the University Of Texas at Austin. Conceptually and programmatically, there is no clear connection between the concepts of democracy, culture and development. However, the influences of Western European countries in the implementation of democratic ideals and development models, plans and programs on the African continent, has created vast fields of play between them, in so doing informing and blending into one another. It is in the context of this that this book comes to the fore. First, to assess the question of whether development undergirds democracy or promote democratic impulses. Second, to scrutinize the casual link between democracy and development, which is taken for granted in our times. Third and finally, to assess the claims of whether culture is dynamic and fluid as it is in the era of increased global flows or as an entity to be compartmentalized or understood in fixed terms. The book takes the concept of culture as its point of departure to explore political, economic and social phenomena, on the grounds that, whenever one defines the concept of development or democracy, the notion of culture assumes a deterministic and influential role in it, and that the precepts of democracy or models of development are usually marked by tangible signs or sets of ideas, visions and claims, which ultimately determine the contours of culture. It is on these grounds that, not only does each of these three concepts supports or denotes group or institutional practices, but also contains conceptual claims with ideological power. This innovative anthology presents an interdisciplinary approach to Yorùbá culture and customs. Written by Yorùbá experts on all continents, the seventy-five chapters in the volume employ a variety of multi-faceted perspectives to provide a detailed study of the Yorùbá people with insights from anthropology, arts, language and linguistics, literature, history, religion, sociology, philosophy, psychology, criminology, law, technology, medicine, pharmacy, engineering, economics, education, political science, music, theater, popular culture, cultural studies, migration and diaspora studies, gender, etc. Each chapter addresses the changes that have taken place in traditional culture. This blend between traditional culture and modifications to such culture gives a balanced and authentic picture of what can be regarded as culture and customs in present-day Yorùbá society. Tóyìn Fálọlá is Jacob and Frances Sanger Mossiker Chair in the Humanities and Distinguished Teaching Professor at the University of Texas at Austin. He is author and editor of more than one hundred books, including Encyclopedia of the Yorùbá (IUP, 2016), The Yorùbá Diaspora in the Atlantic World (IUP, 2005), Yorùbá Warlords of the 19th Century (AWP, 2001), and The Yorùbá Gurus: Indigenous Production of Knowledge in Africa (AWP, 1999). Akíntúndé Akínyẹmí is Professor in the Department of Languages, Literatures, and Cultures and affiliate faculty at the Center for African Studies at the University of Florida. He is author of Orature and Yorùbá Riddles (Palgrave, 2015) and Yorùbá Royal Poetry: A Socio-Historical Exposition and Annotated Translation (BASS, 2004); co-author of Dictionnaire usual Yorùbá-français (AFRA-Karthala, 1997); and co-editor of Encyclopedia of the Yorùbá (IUP, 2016). Starting as a simple compilation of selected lifetime writings, Bright Beams in Dark Shadow evolves into a personal testimony with a thrusting thematic thread; that of the ongoing battle of an ever-challenging Light, with an entrenched and dominant Darkness. Underlying emphasis is given to the fast-accelerating shift in Life Principles and Life Values from our planet’s world of the parochial, into a modern world of emergent universals of inclusion and engagement. The profound and transformative role of cybernetics, recognised and understood by few, emerges as the base platform from which all else in our unfolding future, follows. It is hoped this lengthy selection of odes, articles, critiques and commentaries will provide for the reader a powerful stimulant to a wide range of ponderings, queries and challenges at every level and depth; and indeed on new, penetrating and provocative Perspectives on Light Emergent. Professor Michael Vickers — Taught Political Science at the University of Ife (now Obafemi Awolowo University) Nigeria; taught and conducted research at universities in America, Canada, and the United Kingdom. Recipient of the Distinguished Academic Award (2012) from the University of Ibadan, he is author of several acclaimed books, including Structure and Conflict in Nigeria, 1960-65 (1973) with Ken Post, Ethnicity and Sub-Nationalism in Nigeria (2000), and most recently A Nation Betrayed—Nigeria and the 1957 Minorities Commission (2010), Phantom Ship (2013), On Wings of Light—Reflections on Cybernetics, Africa and the Wider World (2015). He holds a doctorate in Political Science and West African Studies from the University of Birmingham, UK, and is Emeritus Director of Parliamentary and Public Affairs, The Hillfield Agency (UK). Using the scholarship of Toyin Falola as the entry point, The Transformation of Central Nigeria covers significant historical moments in the history of Central Nigeria, a region variously described as the North Central geopolitical zone in Nigeria’s official circles and as the Middle-Belt by its indigenous populations. Centrally located in Nigeria and endowed with vast mineral and agricultural resources, Central Nigeria is a mini-Nigeria, for its ethnic diversity, complicated politics and conflicts. The main achievement of this volume is the analysis of the changes since the colonial period to the present. Sati U. Fwatshak is a Professor in the Department of History and International Studies, University of Jos. His research interests and publications span African economies, African politics, African conflicts, and Islam in Africa. His most recent book is Contemporary Nigeria: Transitional Agencies of Change. Bearing both the professional and general readers in mind, Decolonizing Nigeria: Politics, Power, and Personalities is an innovative approach at crafting a popular history of a great moment in Nigeria’s history. The book is neatly organized into three parts. Part One focuses on the late colonial era’s driving forces to bring about self-determination for Nigeria. Part Two deals with the establishment of developmental institutions for self-government. Part Three is organized under the central theme of “Regionalism and Change,” highlighting the personalities of Nigeria’s most powerful nationalists: Bello, Azikiwe, and Awolowo in relation to how their careers accentuated the structures of regional differences. The final concluding chapter explains the post-independence tasking steps to deal with the “unfinished businesses” of decolonization. Aimed at a wider audience with a blend of grassroots and elitist positions, Decolonizing Nigeria is a monumental work, and a seminal contribution to understanding both the political economies and the geopolitics of the post-colonial multi-ethnic nation states in contemporary global village. Toyin Falola occupies the Frances and Jacob Sanger Mossiker Chair in the Humanities at The University of Texas at Austin. A celebrated scholar of global stature, Falola has published numerous books, most recently, The African Diaspora: Slavery, Migration and Globalization. Bola Dauda is an eminent public administrator and scholar. Widely published, Dr. Dauda’s writings have been translated into Spanish, Chinese, and French. He is co-author of Representative Bureaucracy, Meritocracy, and Nation Building in Nigeria. Why does the future of democracy seem uncertain on the continent? The achievement of this book is to provide answers to this question. First, the book reasons that the democratization processes on the continent are moving forward backwards, in that the preconditions for continued sustainability of democracy are absent and not plentiful in almost all African nations. In Europe, development preceded democracy, whereas in Africa, development and democracy are being implemented concurrently, in the face of austerity measures in order to induce economic growth. Thus, the book argues that development, by all counts, is a precondition for democracy and not the other way round. Second, the book suggests that the democratization processes defy the traditional principles of democracy where power evolves from “bottom up”. In African nations, power evolves from “top to bottom”, creating a deformed and an abnormal form of democracy known as “elite democracy”, imposed on African people by African elites through external influences of Western European countries in the form of political conditionality and adoption of the Bill of Rights by African nations, as preconditions for receiving not only development aid and loans, but also for diplomatic relations. Third, the book concludes that the democratization processes are just experiments of transplantation of Western European values to African nations, since Western European values disregard African traditional values and often dismiss them as irrational and primitive, instead of viewing them as complimentary. Alexius Amtaika is a Research Professor at University of Limpopo in South Africa. He holds a Ph.D. in Political Science from the University of the Witwatersrand in Johannesburg, South Africa, specializing in Political Theory and Governance of Local States. He is the author and editor of four books. He is a former recipient of the University of Michigan African Presidential Research Fellowship (2008–2009). He is also the founding Editor-in-Chief of the Journal of African and Asian Local Government Studies. Mrs. Thelma Coleman Alex, a native of Greensburg, Louisiana, was born on February 13, 1932 during the height of America’s Great Depression. She is one of eleven children born to Mrs. Pinkie Pitts Coleman and Mr. Felbert Coleman. She earned a Bachelor’s Degree from Southern University in Speech and Drama, and a Master’s Degree from the University of Southwestern Louisiana (USL) in Lafayette, Louisiana. On February 14, 1959, then Ms. Thelma Coleman married Rev. Livingston Alex, who together became parents to two daughters: Attorney Joslyn Renee Alex of Breaux Bridge, Louisiana, and Professor Yvette M. Alex-Assensoh of Eugene, Oregon. Together, Mrs. Alex and her late husband, Alex, served the parishioners of Bethlehem Baptist Church, which was pastored by Rev. Alex for 39 years until he went to be with the Lord on November 11, 1998. Before then, Mrs. Alex and her husband built and operated a day-care center that, for almost 30 years, served hundreds of children in the St. Martin Parish area; the center also prepared the children for academic successes and good citizenship. Mrs. Thelma Coleman Alex loved to write, entertain family as well as friends, read and travel nationally and internationally. Apart from serving on local and national boards, she worked for almost three decades as a school teacher and librarian in the St. Martin Parish School System. This collection of stories is her first published book. Getting Our Universities Back on Track is a broad narrative on the state of higher education in Nigeria, undertaken within the context of the author’s experience as Vice Chancellor at Adekunle Ajasin University (AAUA), a pub­lic university in the country, from 2010 to 2015. The process by which the author negotiated the challenges presented by AAUA in those years are care­fully unveiled in a manner that speaks to the emergence of new paradigms for university governance, predicated upon an untrammelled commitment to meritocracy. It is a narrative on the success story of modernization of a public university operating in a particularly difficult policy and politics terrain. It equates a practice manual for university governance in Nigeria, and arguably beyond. Femi Mimiko, mni, is a Professor of Political Science at Obafemi Awolowo University (OAU), Nigeria. He was SSRC-MacArthur Foundation Visiting Scholar, Watson Institute, Brown University, Providence, RI; Korean Foun­dation Visiting Fellow, The Academy of Korean Studies, Seoul; and Senior Fulbright Scholar and Visiting Professor, United States Military Academy (USMA), West Point, NY. He is a recipient of USMA Army Commander’s Public Service Award, 2004; and author of Globalization: The Politics of Global Economic Relations and International Business. Mimiko was Vice Chancellor, Adekunle Ajasin University, Nigeria, 2010 to 2015; and member, the Nation­al Institute, Kuru, Nigeria. In 2016, he had a stint as African and African-American Studies Associate, at Harvard University, Cambridge, MA, USA. A renaissance book about Benin, Edo, Echoes of Great Benin invites you into the quaint world of probably the greatest living traditionalists of this part of modern Nigeria, the Edo. As she struggles for relevance in a country much of which she had ruled before the coming of the British, she is as the proverbial butcher of carrion. Her fingers are slimy with decayed flesh and they stink. She cannot use them to scratch her itchy body. Her art treasures, artifacts and much of her history, she lost to the British in 1897. Her famous dry moat, Iya, has decrepit sections of it left. Ibota, the aural source of Benin stories I knew, now belongs in the past. The people of Benin, the Edo, now speak Pidgin English in their homes. Indeed, Benin is gradually effacing her history and etching out a life of anonymity. Please read on for a peep into a bit of her present and a greater look into much of her past! Solomon Omorodion Uwaifo was born in 1932 in Benin City capital of Edo State. He has lived in Lagos most of his life. An Eisenhower Fellow in 1969, Omo Uwaifo as he prefers to be known in literary circles, is an electrical engineer, a poet, a playwright and a prize winning novelist. His second novel Fattening House was joint winner of the LNG Nigeria Prize for Literature in 2004. His first poetry collection, Litany, was long-listed for the LNG Nigeria Prize for Poetry in 2006. He is the author of several books including Electric Power Distribution Planning and Development, Hanon Publishers, Lagos, 1994, 1998 and 2010. Grounded in the ideas of modernity and progress, this book dwells on the difficulties and challenges of transforming Nigeria. It offers an extensive conversation on political modernity, including a foundation laid as far back as the nineteenth century; the implementation of a number of policies and practices in the first half of the twentieth century; and the trajectories of change after the country’s independence. Arguing that the burdens of the past cannot be divorced from the challenges of the present, Toyin Falola also links the troubled present to an unpredictable future. Toyin Falola is Past President, African Studies Association; Kluge Chair in Countries and Cultures of the South at the Library of Congress; and the Mwalimu Julius Nyerere Chair of Modern Africa, Benue State University. He teaches at the University of Texas at Austin. Introducing the first volume of the Yoruba Studies Review. The Yoruba Studies Review is a refereed biannual journal dedicated to the study of the experience of the Yoruba peoples and their descendants globally. The journal covers all aspects of the Yoruba transnational, national, and regional presence, both in their West Africa’s homeland and in diasporic spaces, past and present. The journal embraces all disciplines in the humanities, social sciences, and the basic /applied sciences in as much as the focus is on the Yoruba affairs and the intersections with other communities and practices worldwide. The journal will foster and encourage interdisciplinary and cross-disciplinary approaches dealing with a wide range of theoretical and applied topics including, but not limited to: cultural production, identities, religion, arts and aesthetics, history, language, knowledge system, philosophy, gender, media, popular culture, education and pedagogy, politics, business, economic issues, social policy, migration, geography and landscape, environment, health, technology, and sustainability. Ìké.ré.-Èkìtì in Art and Cultural Narratives, by délé jé.gé.dé. Please visit Yoruba Studies Review or email yorubastudies@gmail.com to receive a copy. 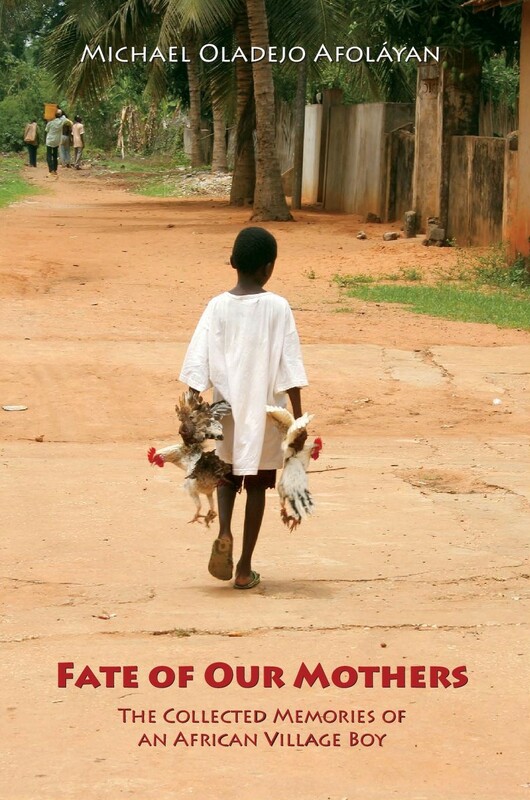 “Childhood is the lost Eden that all adults recall with nostalgia, and in this collection of 13 scintillating stories, one of the finest living writers in the Yoruba language, Akinwumi Isola, plunges back into the archives of memory, and recreates for us some of the delightful episodes of that nirvana of his youth. “Told with his customary poetic skill and wit, his unmatched gift of the gab, his command of the opulent rhetorical resources of the Yorùbá language, the episodes sparkle like precious stones, telling of a time of innocence and of a world that, sadly, can no longer be retrieved. “Here therefore is a narration that is more than a fitting paean to friends that are no more, to a cohesive rural community that time has swallowed, to an ethos of communal living and sharing that modernity has erased. As we follow the adventures of these rumbustious young boys, relishing their triumphs and failures, sharing their pains and laughter, we come to recognize ourselves as we too once were, and we come to a better understanding now of the weaknesses and the strengths of our societies. So compelling indeed is Isola’s evocative skill that these youthful escapades turn on to a mirror of the dreams and the longings that have brought us to where we are today, the flaws that undid us, and the virtues that strengthened us and might still redeem us. -Femi Osofisan, Emeritus Professor, University of Ibadan, Department of Theatre Arts, Distinguished Professor of Theatre, Kwara State University School of Visual and Performing Arts, Ilorin. Pamela J. Olubunmi Smith is Professor of English, Humanities and Women’s Studies at the University of Nebraska at Omaha. Her English translations include: Akinwumi Isola’s Efunsetan Aniwura, Iyalode Ibadan & Olu OmO Tinuubu: Two Historical Plays (2006) and Adebayo Faleti’s Omo Olokun Esin (The Freedom Fight, 2010) from Yoruba. Africa: Development Challenges and Possibilities examines the positive achievements that are being experienced on the continent. In examining Africa’s development paradoxes, one can point to any number of examples illustrating challenges facing the people on the continent. However, there are now many examples of real progress on the ground such as: increase in life expectancy; decreasing infant mortality rates and death rates; and increase in Gross Domestic Product (GDP), and GDP per capita. The book examines the impact of Islam and Christianity in Africa; population growth, environment and the challenge to food production; the impact of the African diaspora; and the role of the African Union in Africa’s development. Amadu Jacky Kaba is an Associate Professor of Sociology at Seton Hall University. Prior to returning to Seton Hall University in 2005, he worked with the late renowned political scientist, Professor Ali A. Mazrui (Post-Doctoral Fellowship), teaching and conducting research in the Social Sciences both at Binghamton University, State University of New York, and Cornell University in Ithaca, New York, from July 2002 to June 30, 2005. He is the author over 70 scholarly publications, including over 50 full-length peer reviewed scholarly journal articles and four books. He earned all of his degrees from Seton Hall University: B.A. in Political Science in 1997; Master’s degree in Public Administration (MPA) in 1998; and Ph.D. in Higher Education Leadership, Management and Policy in May 2002. The essays in this volume provide a framework for understanding contemporary Nigeria’s pains and gains. Nigeria remains a country in transition, characterized by many challenges and positive changes. This book captures its dysfunctional elements as well as its success stories as the continent’s most populous nation, generously endowed with both natural resources and human capital. The various views in this book reflect the twists and turns in Nigeria’s post-colonial experience. Professor Sati U. Fwatshak is a professor in the Department of History and International Studies, University of Jos, Nigeria. His research publications and interests span African social and economic history including the History of African entrepreneurship, African development, African politics, African conflicts, and Islam in Africa. His major publication entitled African Entrepreneurship in Jos, Central Nigeria, 1902–1985 was published in 2011. A.B. Assensoh is an African journalist and historian, a Professor Emeritus of Indiana University, and Courtesy Professor Emeritus of the University of Oregon. He has published widely, including African Political Leadership: Jomo Kenyatta, Kwame Nkrumah, and Julius K. Nyerere, and three co-authored books, Malcolm: A Biography; Malcolm X & Africa; and African Military History & Politics, 1900–Present. The Humanities in Africa addresses issues relevant to the humanities in the African academy, including its methodologies and epistemologies. The nine essays in the volume offer reflections on the role of the various disciplines, the activities of scholars, and the mission of the universities. One of the fundamental arguments in the book is that the diversity of our experience must be manifested in the diversity of our conversation. It addresses the challenges facing the humanities and suggests changes with far-reaching outcomes. Professor Toyin Falola, Past President of the African Studies Association, occupies the Frances and Jacob Sanger Mossiker Chair in the Humanities at the University of Texas at Austin. A celebrated scholar of global stature, he has written widely on knowledge systems and the state of higher education in Africa. 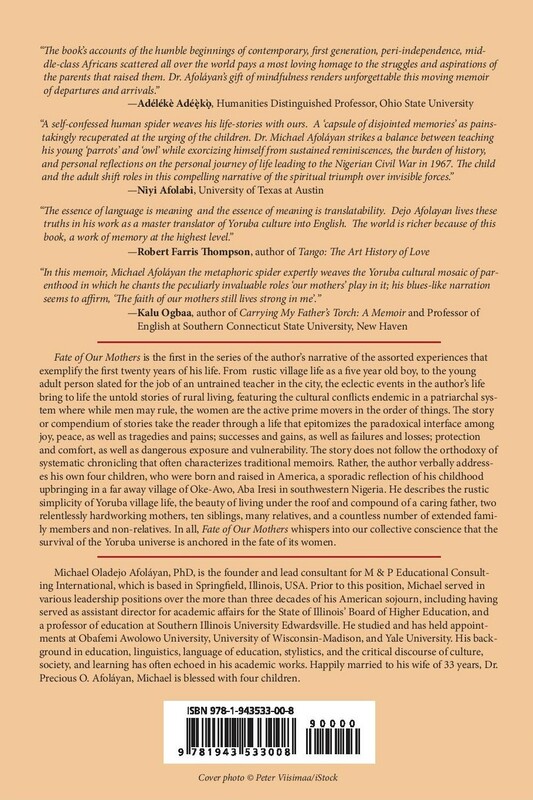 Fate of Our Mothers is the first in the series of the author’s narrative of the assorted experiences that exemplify the first twenty years of his life. From rustic village life as a five year old boy, to the young adult person slated for the job of an untrained teacher in the city, the eclectic events in the author’s life bring to life the untold stories of rural living, featuring the cultural conflicts endemic in a patriarchal system where while men may rule, the women are the active prime movers in the order of things. The story or compendium of stories take the reader through a life that epitomizes the paradoxical interface among joy, peace, as well as tragedies and pains; successes and gains, as well as failures and losses; protection and comfort, as well as dangerous exposure and vulnerability. The story does not follow the orthodoxy of systematic chronicling that often characterizes traditional memoirs. Rather, the author verbally addresses his own four children, who were born and raised in America, a sporadic reflection of his childhood upbringing in a far away village of Oke-Awo, Aba Iresi in southwestern Nigeria. He describes the rustic simplicity of Yoruba village life, the beauty of living under the roof and compound of a caring father, two relentlessly hardworking mothers, ten siblings, many relatives, and a countless number of extended family members and non-relatives. In all, Fate of Our Mothers whispers into our collective conscience that the survival of the Yoruba universe is anchored in the fate of its women. Michael Oladejo Afoláyan, PhD, is the founder and lead consultant for M & P Educational Consulting International, which is based in Springfield, Illinois, USA. Prior to this position, Michael served in various leadership positions over the more than three decades of his American sojourn, including having served as assistant director for academic affairs for the State of Illinois’ Board of Higher Education, and a professor of education at Southern Illinois University Edwardsville. He studied and has held appointments at Obafemi Awolowo University, University of Wisconsin-Madison, and Yale University. His background in education, linguistics, language of education, stylistics, and the critical discourse of culture, society, and learning has often echoed in his academic works. Happily married to his wife of 33 years, Dr. Precious O. Afoláyan, Michael is blessed with four children. 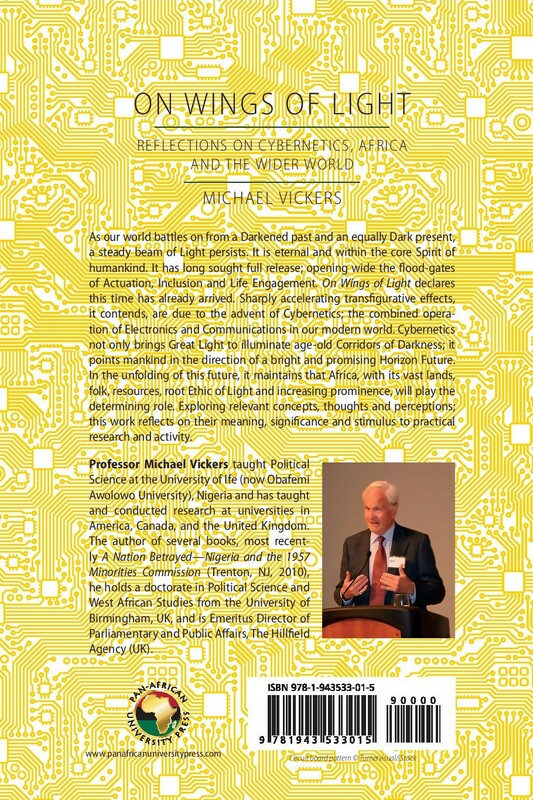 Professor Michael Vickers taught Political Science at the University of Ife (now Obafemi Awolowo University) Nigeria; taught and conducted research at universities in America, Canada, and the United Kingdom; is the recipient of the Distinguished Academic Award (2012) from the Toyin Falola Annual International Conference on Africa and the African Diaspora, (Lagos). He authored (with Ken Post) of Structure and Conflict in Nigeria, 1960-65 (London & Madison, 1973), Ethnicity and Sub-Nationalism in Nigeria (Oxford, 2000), Odes of Forest and Town, (Sussex, 2002), Phantom Trail—Discovering Ancient America, (New York, 2005), A Nation Betrayed—Nigeria and the 1957 Minorities Commission (Trenton, NJ, 2010), Phantom Ship (Trenton, NJ, 2013), and Looking Back from the Future (Forthcoming). He holds a doctorate in Political Science and West African Studies from the University of Birmingham, UK. He is Emeritus Director of Parliamentary and Public Affairs, The Hillfield Agency (UK).